GLORY’s Last Man Standing PPV is rapidly approaching, so it’s nice to see that they’ve launched a new website solely dedicated to the big PPV event on June 21st. You can head over to http://www.gloryppv.com for all of the information on GLORY’s Last Man Standing PPV, including tournament brackets for the tournament itself and a breakdown of the two huge world title fights that go down. Last Man Standing follows GLORY 17 on Spike TV on June 21st, with GLORY 17 airing at 8pm Eastern time and Last Man Standing starting at 10pm Eastern time. 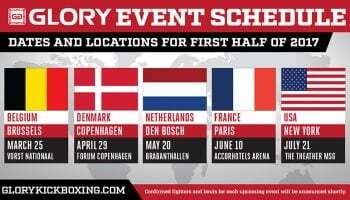 GLORY Last Man Standing will be selling for $34.99 and will feature the GLORY Middleweight Championship tournament as well as the GLORY Heavyweight Championship fight between Rico Verhoeven and Daniel Ghita and the GLORY Welterweight Championship between Joseph Valtellini and Champion Marc de Bonte.